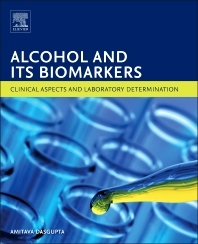 Alcohol and Its Biomarkers: Clinical Aspects and Laboratory Determination is a concise guide to all currently known alcohol biomarkers, their clinical application, and the laboratory methods used to detect them. Pathologists can use this resource to understand the limitations and cost factors associated with each method for determining certain alcohol biomarkers. In addition, interferences in these determinations are discussed, so that clinicians can understand the causes of falsely elevated biomarkers and pathologists and laboratory scientists can potentially eliminate them. The book focuses on the analytical methods used to detect alcohol in blood and urine, the limitations of alcohol determination using enzymatic methods, and the differences between clinical and forensic alcohol measurement. Chapters also cover cutting-edge alcohol biomarkers for potential use.